Lots of talk about travel featuring my moving day bruises! And some craft, promise! The Linus Connection, the local blanket making charity I volunteer for. Hocus Pocus Quilt Along on Fandom in Stitches! This entry was posted in talk to me tuesday, ttmt and tagged crochet, england, scotland, talk to me tuesday, travel, ttmt, vlog on October 2, 2018 by Jennifer Ofenstein. TTMT #389 – Post-Travel Edition, Some Housekeeping & a Flickr Prize! Portobello Hotel, Notting Hill – The awesome boutique hotel we called home for a week. Sherlock Holmes Museum – There’s not a lot on the website, but google it, there are pics! I can’t understate how amazing this was for a Holmes fan! I’d love to ONLY talk about our trip to England, but I have some housekeeping to do as well. First of all, Craftsy relaunched on October 1. They’ve changed their entire structure, including how links are created. Among other things, the permalink to the Sewhooked pattern shop disappeared. I’ve emailed them for help and hope to have it sorted out soon. In the meantime, you can still find all of my patterns published through Craftsy, including My Favorite Things, by going to my Craftsy profile. Secondly, Google has been doing some updates to Blogger. Fandom in Stitches is hosted on Blogger. I came home from vacation to a half-functioning FiS. (Do you, too, sense a post-vacation trend?) The menus disappeared, among other things. I’m working on it as quickly as I can, in the meantime, if you can’t find something, please let me know by emailing the Fandom in Stitches Admin address. I’m happy to share that The Linus Connection website has been unaffected by all this craziness! Small favors, right? I was so excited in my video today, that I forgot to mention that the October BOM pattern went live on Friday. Thank you to everyone that’s already commented and shared photos of your blocks! Starts tomorrow on Fandom in Stitches! The September 2016 sewhooked.com participation prize is a digital copy of my pattern set, Mustachio! 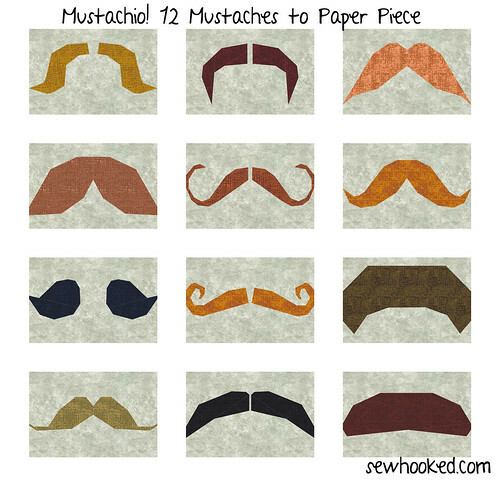 12 Mustaches to Paper Piece. Just in time for Movember! Get it on Craftsy or Etsy! 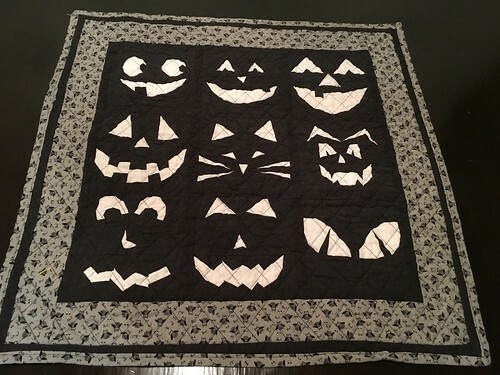 The September winner is Rainey Turner with this awesome Jack’s Lanterns quilt! I apologize for not posting all of the September photos from the Flickr Group. As you might imagine, I’ve been swamped with all the website issues and I’m doing my best to catch up. If you’d like to see the rest of the awesome project photos for this month, please visit the Sewhooked Flickr group. If you’d like a chance to win next month, share your photos with that same group. Want to sponsor a 2016 prize? Please drop me an email! Free Pattern Day is the first of every month during 2016! This entry was posted in family, talk to me tuesday, ttmt, vlog and tagged england, flickr, flickr winner, holiday, london, talk to me tuesday, ttmt, vacation, vicky, vlog on October 4, 2016 by Jennifer Ofenstein.